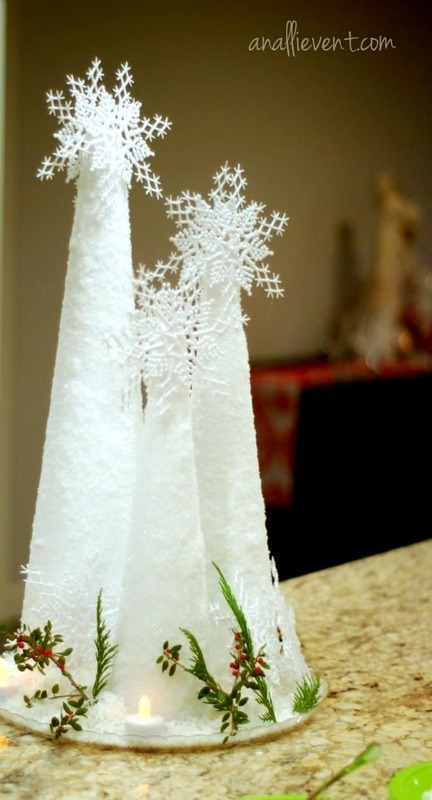 When I’m decorating for Christmas events, I’m always in need of some faux snow. And I’ve never been too crazy about the imitation stuff found at craft stores. Faux Snow (aka Epsom Salt) 16 oz. This is gonna get messy! Pour 1/4 of the box of Epsom Salt onto a large baking sheet or a sheet of aluminum foil or wax paper. Pour some Mod Podge into a paper plate. With your hands, smear the Mod Podge over the half of the tree that is facing up. Roll in salt. Complete other half. I set them on paper plates to dry. As the salt becomes gummy (from the glue) dispose of it and replenish your large sheet of paper or baking sheet. You can make snow drifts, throw snow balls, let’s not go that far; it’s not real, you know! It’s faux! Helpful Hint: When I’m using faux snow to showcase a food item, I always use shredded coconut. Have not tried the Cheapo Faux Snow yet, but I really, really love that you did a printer friendly version. Seldom done these days. Thank you! Glad you like the printer version! I’m kinda old school! Once I found that cheapo snow, that’s all I use for fake snow!